The 2017-18 Notre Dame Lady Titans. The 2017-18 Minford Lady Falcons. To win a conference championship, it takes tremendous sacrifice from every single member of a program in order to achieve such a goal. However, that tremendous sacrifice is only amplified to an even greater extent when an undefeated mark becomes a real possibility in addition to the championship hardware and deep postseason tournament run that is desired. 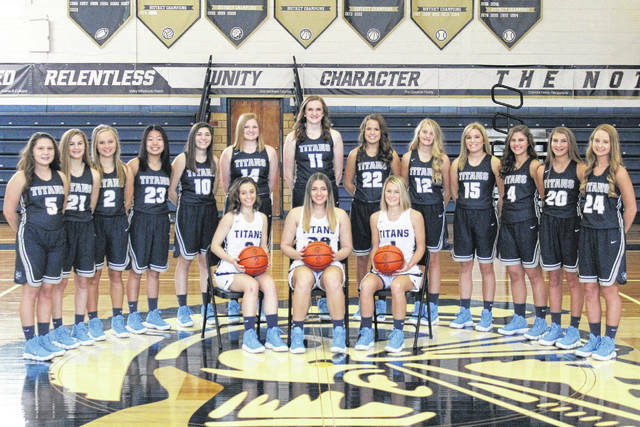 For the Notre Dame Titans’ girls basketball program, it was about defending and upholding an increasing tradition that has become the norm within its camp. 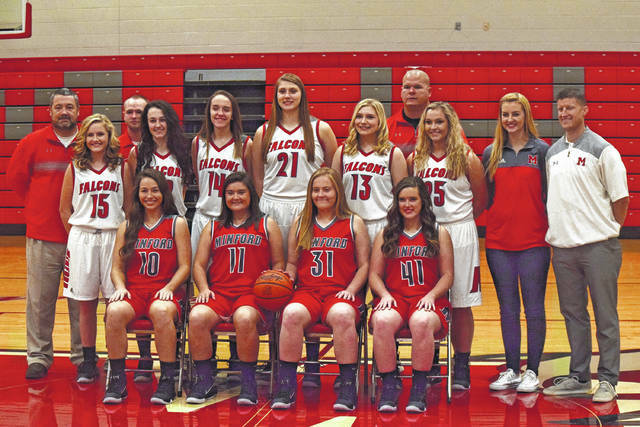 For the Minford Falcons’ girls basketball program, it was about breaking through and exercising the demons that had become very real from the close defeats and losses that had stymied possible conference championship runs and deep postseason tournament showings. Those two paths, as different as they may be, have meshed together into one common theme — undefeated. Standing at a combined 41-0 (21-0 for Notre Dame, 20-0 for Minford) as the 2017-18 regular season enters its final days, both programs used either the traditions of yore or the will and desire to start up an entirely new tradition en route to claiming outright SOC I and SOC II titles at a perfect 14-0 — and in dominating fashion, mind you. For J.D. McKenzie, Notre Dame’s SOC I title — which was the sixth in the last seven years for the growing Division IV powerhouse — is a result of the leadership torch being passed down in a successful manner year after year. As for Minford, its title-winning SOC II run, much like Notre Dame’s, have come on the backs of a group of upperclassmen — that including starters Erin Daniels, Ashley Blankenship, Caitlyn Puckett, and Marissa Risner, among others who partake in key roles off of the bench — who have longed to start a new, almighty tradition that will carry on year after year. But as any coach will tell you, it starts with having the athletes to make a run. And both programs certainly have plenty of those at their disposal. Of the traditional five starters that play for both teams, nine of the 10 girls who start between the two programs are multi-sport athletes. When you throw in valuable bench hands such as Zoe Doll, Hannah Tolle, and Marissa Watters from Minford, or Ali Smith, Clara Hash, and Cassie Schaefer from Notre Dame — just to name a few — the vast majority of players are not only multi-sport athletes, but gamers who have earned All-SOC honors or All-SOC and All-Southeast District honors in at least one sport in doing so. And with most of these girls having developed a tight bond since they were of adolescent ages, built-in team chemistry — with most of these girls spending at least nine months at a time with each other both inside and outside of school — only makes the respective units in question more dangerous. That built-in team chemistry also brings with it an insatiable need to share the rock and find the open player on the floor. Katie Dettwiller may lead Notre Dame with 15.6 points, 10 rebounds, and 5.2 blocks per contest, but the junior is followed by five additional hands who average at least 3.9 points per game, including Lexi Smith, Ava Hassel, Taylor Schmidt, Clara Hash, and Ali Smith. Smith, Hassel, and Schmidt each average at least 8.7 points or more per game along with Dettwiller, while Hassel and Molly Hoover each have at least 3.8 assists per contest or more. Schmidt, Hassel and Hoover each have 2.9 steals or more while Dettwiller and Smith each have obtained at least 8.8 rebounds per affair. While Notre Dame’s success has been part of an ongoing theme that the Lady Titans have put together, Minford found the going a big together in the SOC II realm. The year before Caudill’s arrival, Minford finished just 9-9 over the 2014-15 campaign and lost eight more affairs in Caudill’s first season in 2015-16 with a young roster. But after starting the 2016-17 season at a middling 3-3 overall, Minford won 16 of its last 19 affairs to finish 19-6, and hasn’t looked back since, with a lone SOC II loss to Wheelersburg on Jan. 16, 2017 being the only blemish on the conference record since Dec. 5, 2015. That is due, in large part, to the maturation of its core — and its ability to stay balanced. While Daniels — who is destined to become the school’s all-time leading scorer when the 2017-18 season is over — leads the team in most categories, she has been joined by as many as three additional teammates in double-figures during a contest. But make no mistake about it, the young ladies at both schools are competitors. Practices have become so intense, as a matter of fact, that both coaches have said that the practices themselves are harder that some of the tests that they face every other night from other opponents. And with both units playing their best basketball at the right time, it’s very possible that those tough practices could very well pay off into some serious hardware come March. https://www.portsmouth-dailytimes.com/wp-content/uploads/sites/28/2018/02/web1_IMG_5702JPG.jpgThe 2017-18 Notre Dame Lady Titans.